Studs are released back onto the range at the end of the recent Sulphur HMA roundup in Utah. Photo by humane observer Steve Paige for RTF. Return to Freedom opposes the inhumane and costly system of capturing and permanently removing wild horses from the range (especially by helicopter drive trapping), separating them from their family bands, and placing the vast majority in long-term holding facilities. RTF advocates for the judicious use of fertility control and a reevaluation of the Bureau of Land Management’s “Appropriate Management Level” as part of multi-pronged approach to humane policies and practices that would provide America’s iconic wild horses and burros with a more equitable share of resources and a sustainable future on the range. Wranglers for the U.S. Bureau of Land Management completed a roundup of 655 wild horses from Utah’s West Desert in late January, but the agency’s decision to return dozens back to the range has prompted a lawsuit from Beaver County. In the suit filed Monday in U.S. District Court, the county’s lawyers allege the BLM is shirking its legal duty under the Wild Free-Roaming Horses and Burros Act of 1971 to keep horse populations below certain thresholds, known as “appropriate management levels,” or AMLs, and degrading the range and displacing livestock in the process. The failure to keep horse numbers in check “has caused serious damage to public and private rangeland, created a threat to the health and safety of the public and the wild horses, and resulted in significant economic harm to Beaver County,” wrote the county’s lawyer, Jeffrey Bramble. The county seeks an order to remove “all excess” horses, arguing that the BLM’s plan could result in up to $1.1 million in “opportunity costs” to the local economy. The extra horses’ depletion of forage and water “infringes upon the rights of Beaver County citizens who hold grazing permits and leases to conduct livestock operations on private, state, and federal lands,” the suit states. The BLM declined to comment on the litigation, but the agency says it lacks the corral space and funding to take in the number of horses Beaver and other rural Utah counties want off the range. The government is loath to euthanize healthy horses, and there are not enough people interested in adopting wild horses, so most of the animals not returned to the range are added to the 45,000 already warehoused for life in contract corrals. Recognizing the situation as unsustainable, the BLM is experimenting with fertility control as a fresh alternative that federal officials hope can appease all sides in an issue that pits horse advocates against ranchers. But that, too, is controversial. Utah’s West Desert is the scene of three big roundups, known as “gathers,” this winter; two are completed and the third is slated to begin Saturday after a federal judge declined to an issue an injunction sought by an animal-welfare group. The Sulphur gather in Beaver County wrapped up Jan. 31. The BLM had planned to return 400 animals back to the range, but decided to return only 192. The eighty mares in this group were injected with fertility-control treatments, while the studs were left intact. 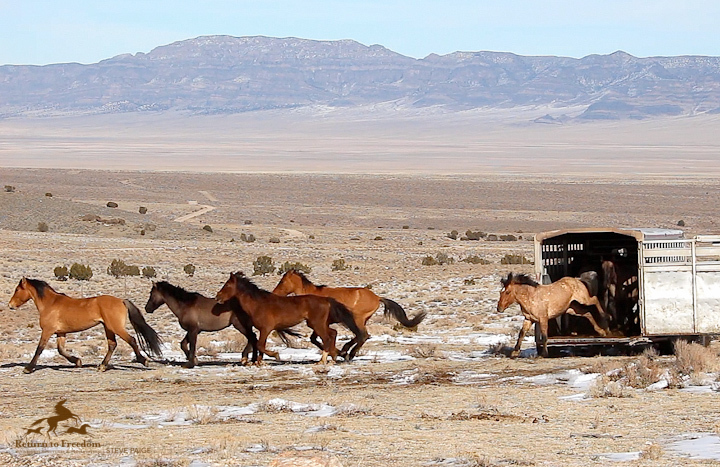 The agency was only able to get authorization for this gather because Sulphur horses have been posing a public-safety threat along State Route 21 and the gather plan relied heavily on fertility control, according to BLM spokeswoman Lisa Reid. “Removing horses to [appropriate management level] is not on the top of the list of our priorities,” Reid said. During the two-week Sulphur operation, 450 of the herd’s estimated 1,150 horses were left on the herd management area outside Milford. This is more than double the 165 to 250 horses the BLM says are appropriate for this area. The agency’s plan to return horses defies a legal obligation to keep numbers below 250 here, the Beaver suit alleges. Horse advocates, meanwhile, blasted the Beaver County suit as a waste of the court’s time. Roy said she believes the AMLs are arbitrarily set and have little grounding in science, and that livestock, particularly sheep, are the bigger threat to range conditions at Sulphur, one of Utah’s 19 horse management areas. In its own environmental review, however, the BLM concluded the wild horses will deplete forage if allowed to proliferate. As a testament to the depleted range, BLM wranglers noted the Sulphur horses were in sub-par condition as they were herded into pens last month, according to Reid. Some 26 were so weak they had to be euthanized, and another four put down after sustaining injuries while being directed toward holding pens or chutes. One severed its spine when it panicked and crashed into a gate. The BLM takes steps to avoid harming the horses, but injuries do happen and such mishaps are cited by animal-welfare advocates in their own legal battles against horse removals, which they view as costly, ineffective and inhumane. One group alleged fertility treatments are a potential threat to horse health in its failed bid to stop this month’s Cedar Mountain gather in Tooele County. The BLM plans to use helicopters to gather up to 700 horses, then return up to 200 treated mares and an equal number studs. A federal judge in Washington D.C. on Tuesday rejected the injunction request brought by Friends of Animals, which alleged the BLM hadn’t sufficiently studied the impact of fertility treatments on horse populations. The group has said it will appeal. This position puts Friends at odds with most horse advocacy groups, which support birth control, according to Roy. Please consider a contribution to the Wild Horse Defense Fund, which fuels Return to Freedom’s selective litigation efforts, humane observation of roundups, policy reform and advocacy.